Am 21.12.2004 gegen 1250 UTC startete die bisher weltweit größte und stärkste Trägerrakete. 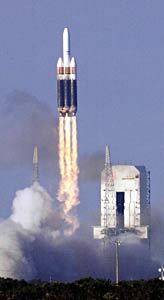 Die fast 71 Meter lange "Delta IV Heavy" startete in Cape Canaveral im US-Bundesstaat Florida. Der Start der Superrakete war zuvor mehrmals wegen schlechten Wetters oder technischer Probleme verschoben worden. Mit an Bord war ein mehr als sechs Tonnen schwerer Demonstrationssatellit, der in rund 36.000 Kilometer Höhe ausgesetzt werden sollte. Als weitere Payload befanden sich zwei sogenannte 3-Corner-Satelliten (Ralphie und Sparkie) an Bord. Sie wurden wiederum in einer sehr niedrigen Umlaufbahn ausgesetzt und umkreisen die Erde in einem etwa 165-225 km hohen Orbit. Daher ist ihre Lebensdauer auf wenige Tage (2-3 Wochen) beschränkt, bevor sie wieder in der Erdatmosphäre verglühen. Für die superstarke Trägerrakete hat Boeing nach eigenen Angaben erstmals seit 25 Jahren wieder ein neues Triebwerk hergestellt, das eine Mischung aus flüssigem Wasserstoff und Flüssigsauerstoff verbrennt. Die "Delta IV Heavy" entwickelt eine maximale Schubkraft von 663.000 Pfund. Mit der "Delta IV Heavy" könnten rund 22 Tonnen Last in einen erdnahen Orbit beispielsweise zur Internationalen Raumstation ISS gebracht werden. Die Kraft des Supergeschosses ist so stark, dass sie zehn Tonnen Last auf den Weg zum Mond sowie acht Tonnen auf eine Umlaufbahn zu den Nachbarplaneten Mars und Venus bringen könnte. Die beiden Satelliten wurden jedoch in einen komplett falschen Orbit ausgesetzt. Wegen der zu geringen Höhe umrundeten sie nicht einmal die Erde und verglühten bereits nach kurzer Zeit in der Erdatmosphäre. A pair of University of Colorado-built student satellites appeared to be lost in space Tuesday night after a Boeing rocket launched them into a seemingly useless orbit, far from their targeted destination. Student engineers tried in vain to contact the pair of 35-pound satellites - nicknamed Ralphie and Sparky - for several hours following the launch from Florida's Cape Canaveral at 2:50 p.m. MST. The tiny, six-sided satellites, each about the size of a microwave oven, hitched a ride on the massive new Boeing Delta 4-Heavy during its maiden flight. "It's a big disappointment, but we still accomplished a lot, and we're just all thankful to get this far with the mission," said Ryan Olds, 23, mission operations leader for the CU team. "We can't be disappointed with ourselves, because what happened was beyond our control," said Olds, who graduated last week with a degree in aerospace engineering. Robert Villanueva, a spokesman for the Boeing Delta launch team, said that mission officials were still trying to determine what happened. The rocket was supposed to deploy the twin satellites about 135 miles above the Earth to begin a two- to three-day study of storm clouds. Instead, it appeared that the satellites were dragged further into space, into an extremely elliptical orbit with a high point of nearly 20,000 miles and a low point of a few hundred miles. If that's what occurred, the students won't be able to contact the satellites unless they happen to pass directly over one of the team's four ground stations - in Arizona, New Mexico, Florida and Puerto Rico - at the low point in their orbits, Olds said last night. "Unless that happens, they will be too far away," he said. The $200,000 Three-Corner Sat mission is a joint effort of students - mainly undergraduates - at the University of Colorado, Arizona State University and New Mexico State University. The Air Force paid for the project. Students at the three universities are members of the NASA-funded Space Grant Consortium program. About 120 CU students worked on the Three-Corner project, the first satellite mission tackled by the Colorado Space Grant Consortium. For the student team, Tuesday was a roller-coaster ride. Early afternoon delays were followed by a launch that appeared picture-perfect. The 232-foot-tall, triple-bodied rocket rose from the pad on a pillar of orange flame and gray smoke, then disappeared into a cobalt sky. But the students were unable to contact the satellites in the hours after the launch. They suspected that batteries in the satellites drained during the launch delays and thought that Ralphie and Sparky would call home after their solar panels recharged the batteries. "We got no response at all. Nothing," said junior aerospace engineering major James Burkert, 21. "That's a little strange, and we'll try to figure out what went wrong," Burkert said late in the afternoon. Later, Boeing notified the students that the satellites reached an altitude of just 62 miles, not the planned 135 miles, said team member Jen Michels, 23, a senior CU electrical-engineering major. Sixty-two miles is too low to sustain a stable orbit and would mean the satellites had probably burned up in the atmosphere. The students waited for word from NORAD in Colorado Springs, which tracks objects in Earth orbit. "If NORAD can't find it, then it's just not up there," Michels said. "That means it's burned up in the atmosphere." But shortly after 7:30 p.m., the team got word from NORAD that trackers had found evidence that two objects - possibly the twin satellites - followed the Delta's upper stage toward an orbit with a high point nearly 20,000 miles above the Earth, Olds said. The Delta upper stage and its payload were heading for a location called geosynchronous orbit, about 19,622 miles above the Earth. "We're not burned up at this point, just on the way to geosynchronous orbit," Olds said.